While struggling with my ongoing quest to be thinner, I found some health tips that suggest going meatless one day out of the week. A lot of people do “Meatless Mondays”. This time of year, many people also give up meat on Fridays during Lent. This past Monday I decided to give it a try and this is what I had for dinner. I adapted the recipe from the Fat Burning Meal Plan book that comes with the Jillian Michaels Body Revolution workout program. 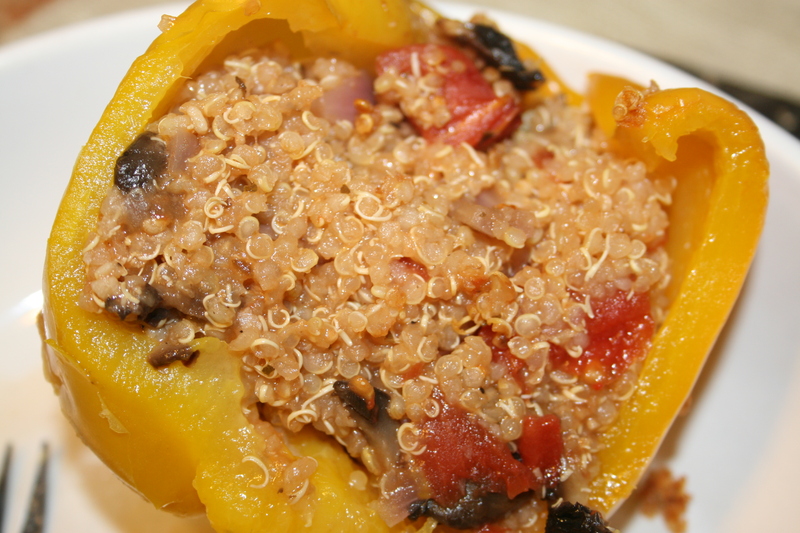 It doesn’t seem like a lot when you think your dinner will just be a pepper stuffed with circular rice, but the quinoa is so filling and the meal leaves you feeling healthy. 2. Boil 1 & 1/2 cups water in a small pot. Add quinoa and simmer for 15 minutes. 3. 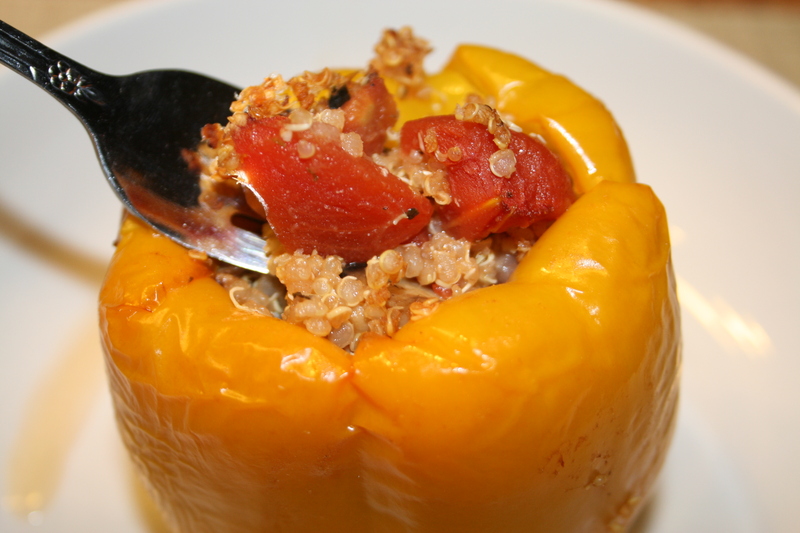 While quinoa is simmering, core the peppers and microwave them for 3 minutes. 4. Heat oil, garlic, red pepper flakes, mushrooms, and onion in a large skillet until the mushrooms begin to brown. 5. Stir in tomatoes and oregano. 6. Add in quinoa until well incorporated. 7. Add 1 inch water to a small baking dish. 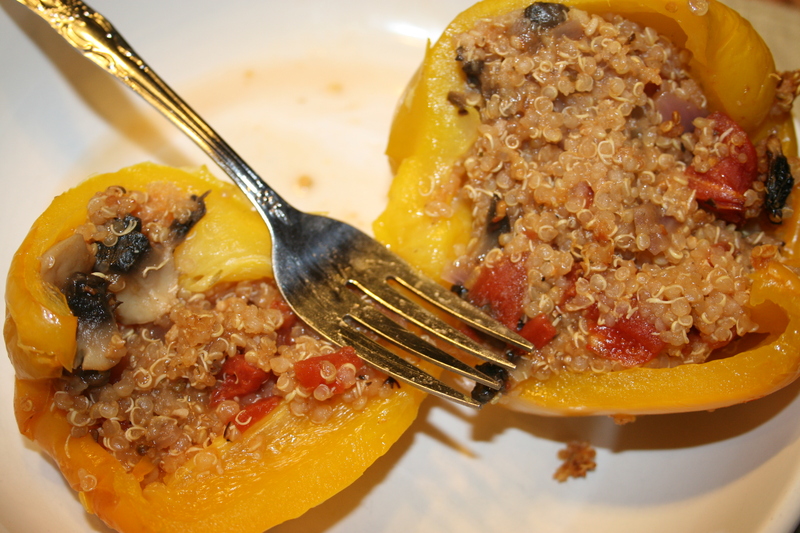 Place peppers inside of it. 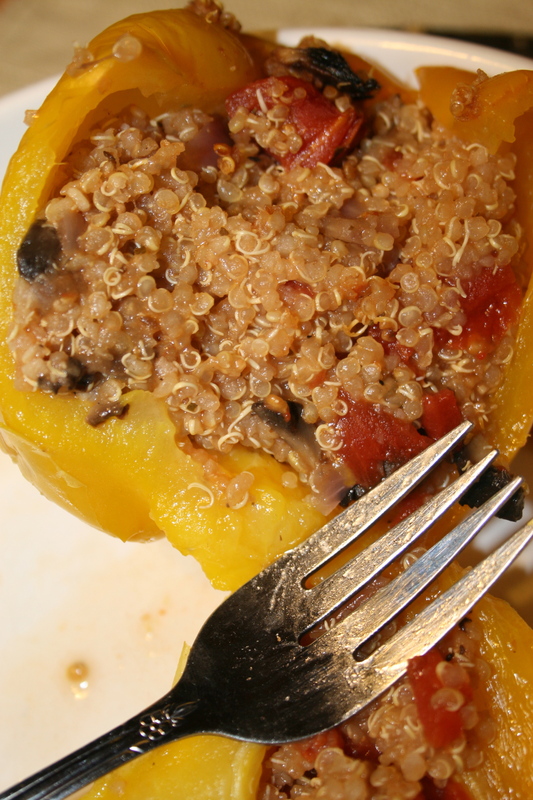 Divide the quinoa mixture into the peppers and bake for 30 minutes. Thank you. This sounds fantastic and I will definitely try this tonight for dinner. I’ve been searching for good sounding quinoa recipes. Thanks again.